Posted by santos. This entry was posted on 20051104 at 11:10 AM You can skip to the end and leave a response. this is great santos. copyright infringment be damned! now i wish i could remember the name of the book. i think i may buy it. Hi there, I got here from following your ice candy recipe or post link[grin]. Anyway, I was just looking for a recipe on how to make ice-candies, I love them too. I am a Filipina eh, residing in Roseville, MI U.S.A. I thought I'd leave my footprints here, so you know I've been here[smile]. No taggy board, so I had to leave my message here, i hope you don't mind. Your blog is great, very resourceful of info. "Asparagus, asparagus... put it on your table. Asparagus, asparagus... it'll please your Aunt Mabel!" looks great! I wrap beef slices around asparagus and bake/grill them. hi gloop! and i'm pleased to please mah aunt mabel. hi mumu! ooh, i like that too. Yum! 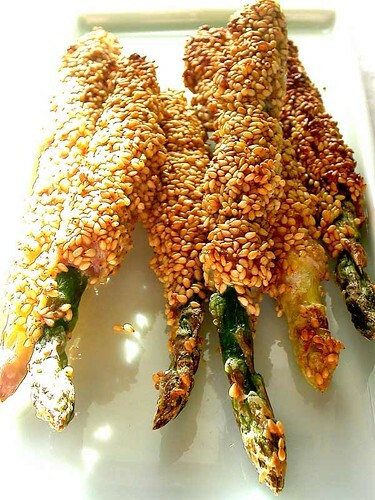 It reminds me of this appetizer I've had... lovely asparagus bundles wrapped in bacon, drizzled with melted butter, sprinkled with brown sugar and baked in a casserole dish. hi bunny! bacon, butter, *and* brown sugar?! wow, i have to try that! hi scott! thanks for the kind words. i'll have to stop by if i'm ever in warsaw (it's entirely possible). What a wonderful blog you've created with delicious, descriptive, and insightful observations and gorgeous images. I want to taste everything! I'm attending a Christmas party in a couple days and need to fit into my party dress. So, after that I'm going to try this recipe, that comforting mozzarella en carrozza and many more of your suggestions. CAN NOT WAIT!